In Earth's solar system, evidence of subsurface ice, ancient valley networks, and even an ancient ocean occurs on the planet Mars. Water ice and perhaps liquid water occur beneath the frozen surfaces of three of Jupiter's moons, although currently none have free surface waters. But among the planets orbiting the Sun, Earth is clearly the "water planet." Water occurs on its surface as liquid, ice, and gas. Ocean waters now cover nearly 71 percent of Earth's surface, whereas fresh waters in lakes and rivers cover less than 1 percent. Thick ice sheets permanently cover Earth's polar regions and glaciers are widespread in its higher mountains. Water in the form of clouds masks about half of Earth's surface at any time. Volcanic eruptions continually extract water and gases from rocks deep in Earth's interior. Water and gases from comets and meteors colliding with the early Earth are believed to have contributed to its ocean and atmosphere over many billions of years. After intense and destructive meteorite bombardments ended about 3.9 billion years ago, the present ocean and atmosphere were formed. Most of Earth's surface water (97 percent) accumulated in ocean basins , with lesser amounts (about 3 percent) forming thick ice sheets on what are now Greenland and Antarctica. Only a small fraction of Earth's water occurred in lakes, rivers, or mountain glaciers. As living organisms evolved and became more abundant, they modified the composition of Earth's atmosphere. For instance, photosynthesis by plants contributed oxygen, making the evolution of animals possible. Today, Earth's rich and diverse life forms depend on its abundant water. All life on Earth is thought to have originated in the ocean, and today water makes up 60 to 70 percent of all living matter. About two-thirds of the human body is composed of water. Humans can live no more than a week without drinking water. 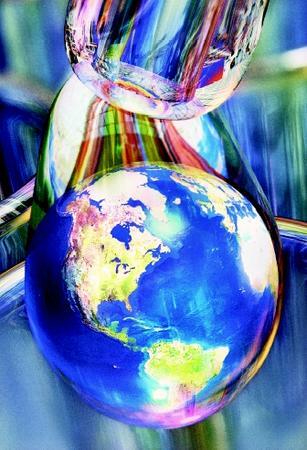 Earth's water moves in several cycles, each driven by different energy sources and acting over various periods of time. The slowest cycle affecting Earth's water movement is called plate tectonics . Powered by heat from Earth's interior, tectonic processes act over millions and probably billions of years, slowly moving Earth's crust to build continents and shape ocean basins (only to be eventually destroyed). The presence of liquid water on Earth makes it unique in the solar system. Life on Earth relies on water, which comprises 60 to 70 percent of all living matter. Volcanic and metamorphic activity associated with plate tectonics melts and extracts water and gases from deeply buried rocks, and later releases them at Earth's surface during volcanic eruptions. Volcanic activity also supplied much of the ocean's salts. Sea water flows through fractured, newly formed, hot volcanic rocks at mid-ocean ridges and reacts chemically with them. The salts are discharged into the ocean. Smaller amounts of salt are extracted from rocks on land, which have been altered by weathering . Streams transport weathered rock fragments, sediments, and salts to the ocean. Compared to surface waters, less is known about water flowing through sediment deposits (e.g., sands and gravels) and through water-bearing rock formations known as aquifers. These underground waters eventually return to the ocean by way of rivers and lakes, and through the submerged edges of the continents. On a global scale, neither the amounts nor rates of such groundwater flows are well known. Water moves more rapidly across Earth's surface in cycles powered by solar energy than water that moves at or below the surface. In a process known as the hydrologic cycle , water evaporates from ocean surfaces warmed by energy from the Sun. Most of the vapor condenses quickly and falls over the nearby ocean as rain. Some water vapor travels farther to fall on land, and eventually returns to the ocean by river discharges and also by discharges of groundwater through the rocks and sediments of continental margins. Winds blowing across the ocean set its surface waters in motion. The resulting surface currents flow primarily from east to west near the equator. Elsewhere these surface currents form nearly closed patterns, called gyres , centered in the subtropics. Stronger surface currents occur near the ocean margins. When ocean waters cool near the poles—especially in the Antarctic and North Atlantic Oceans—they become denser and sink below the surface. There they flow slowly in sluggish subsurface currents toward the equator, where they eventually return to the surface to be warmed and to begin the cycle again. Such subsurface currents take many hundreds of years to complete their cycle. These subsurface currents are part of Earth's heating system, returning cool waters to the tropics to be warmed again for the return flows in surface currents to polar oceans. Although sluggish subsurface ocean currents involve water movements measured over centuries, surface ocean currents move sea water across ocean basins in time periods measured in years. Winds can transport water vapor across continents in only a few days. SEE ALSO Astrobiology: Water and the Potential for Extraterrestrial Life ; Climate and the Ocean ; Comets and Meteorites, Water in ; Earth' S Interior, Water in the ; Fresh Water, Physics and Chemistry of ; Hydrologic Cycle ; Mars, Water on ; Ocean Currents ; Plate Tectonics ; Solar System, Water in the ; Volcanoes and Water ; Weather and the Ocean . Berner, Elizabeth A., and Robert A. Berner. The Global Water Cycle. Upper SaddleRiver, NJ: Prentice Hall, 1987. Gross, M. Grant, and Elizabeth Gross. Oceanography: A View of Earth, 7th ed. UpperSaddle River, NJ: Prentice Hall, 1996. The flow of surface ocean waters to the poles and their return flow as subsurface currents is known as the "Global Ocean Conveyer Belt." Heat transported by these flows helps cause the relatively mild climate of western Northern Europe, keeping it warmer than lands in Canada at comparable distances north of the equator. Such currents and the energy they transport regulate Earth's climate over decades to centuries.